A fast radio burst (FRB) is a short burst of intense radio energy originating from outside our galaxy. We aren’t sure what causes FRBs, though the likely candidate is a white dwarf or neutron star falling into a black hole. They only last a few milliseconds, which makes them a challenge to study, but their brief duration may also allow us to test the limits of general relativity. The foundational idea of general relativity is known as the principle of equivalence. On a basic level it states that two objects of different masses should fall at the same rate under the influence of gravity. The principle is necessary to equate the apparent force of gravity with a curvature of spacetime. So far all tests of the equivalence principle have confirmed it to the limits of observation, but there’s an interesting catch. 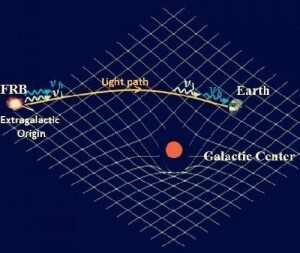 Since relativity also states that there is a connection between mass and energy, the equivalence principle should also hold for two objects of different energy. 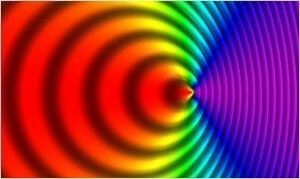 Specifically, two beams of light with different wavelengths (and therefore different energies) should be affected by gravity in the same way. 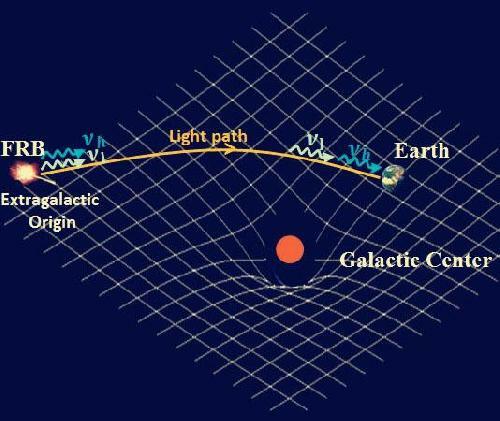 We know that the path of light is changed by the curvature of space (an effect known as gravitational lensing), but the curvature also affects the travel time of light from its source to us (known as the Shapiro time delay). According to relativity, the amount of curvature and the time delay shouldn’t depend upon the wavelength of light. This means we can in principle use FRBs to test this idea. Since FRBs only last milliseconds, they provide a sharp pulse of light at a range of frequencies. If relativity is correct, then the pulse we observe won’t be affected by gravity. 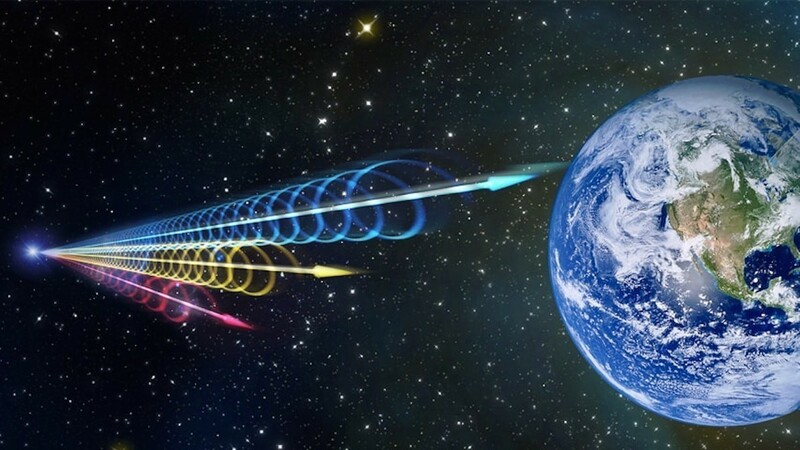 If the equivalence principle is wrong, then shorter wavelengths of radio waves from the burst could arrive at a different time than longer wavelengths. We already see different wavelengths arrive at different times due to the interaction between the radio waves and the interstellar plasma in our galaxy, but we know from other observations how much that shift should be. The key is to test whether there is an additional shift not accounted for by standard physics. Relativity is an extremely well-tested scientific theory, so I wouldn’t count on FRBs showing an energy-based effect, but it’s great that we could have yet another way to test our model. It’s a win-win, since we’ll either confirm our theory yet again, or we’ll discover something new to explore.